Uruguay will go as far as Luis Suarez takes them. At least that’s been the theory going into big tournaments. Unfortunately for La Celeste, Suarez hasn’t exactly been available to take them anywhere recently, thanks to his appetite for opposing defenders. His chomp on Italy’s Giorgio Chiellini at the 2014 World Cup — the third biting scandal of Suarez’s career — earned him an immediate nine-match suspension from international competition as part of FIFA’s punishment. That prevented Suarez from taking part in Uruguay’s Round of 16 match vs Colombia that year, which they lost, as well as last year’s disappointing Copa America campaign and the first four 2018 World Cup qualifiers. For Copa America Centenario, Uruguay will be without Suarez once again to start, this time to a hamstring injury the Barcelona star suffered in last month’s Copa del Rey final. But it might not be as grim a scenario as it appears. Suarez could be back in time for the knockout stage, and Uruguay still have plenty of talent left to at least get them there. Stocked with another world-class striker in Edinson Cavani and a reliably stout defense led by captain Diego Godin behind him, La Celeste are still favored to get out of a group with Mexico, last year’s surprise Gold Cup finalists Jamaica and Venezuela. Defense and organization have long been the hallmark of Uruguay’s play, and key to the team’s 2011 Copa America title run and fourth-place finish at the 2010 World Cup. With Godin, his Atletico Madrid teammate Jose Gimenes, and Porto’s Maxi Pereira in the veteran backline, Uruguay will continue to keep games close enough to give them a chance to win. The question is: can their other forwards deliver? There’s no denying this a much less formidable unit without "El Pistolero" leading the charge. At last year’s Copa America in Chile, Uruguay scored just two goals in its four games as they fell to the hosts in the quarterfinals. Neither Cavani, Diego Rolan nor Abel Hernandez were able to generate a single goal, indicative of Suarez’s importance as not only a scorer, but as a creator for his strike partners as well. 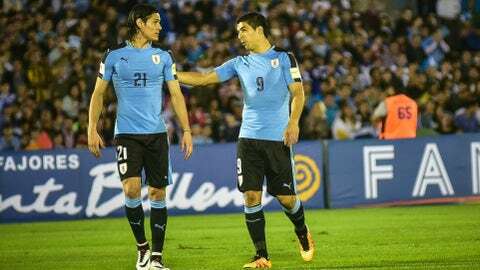 Can Cavani carry the load while Suarez remains sidelined? When Suarez is on the pitch, Uruguay can be breathtaking to watch. In the World Cup match before The Bite, Suarez scored both goals in Uruguay’s critical 2-1 win over England. In his first two games back from suspension, Suarez scored the equalizer in a 2-2 draw against Brazil, then assisted on Cavani’s game-winner against Peru in a pair of World Cup qualifiers in March. Those results have kept Uruguay atop CONMEBOL’s World Cup qualifying table and tied for first in goals scored. That success, however, is also a product of the team having started to play better without their linchpin. Uruguay’s pair of 3-0 wins over Chile and Colombia in World Cup qualifying came before Suarez’s return, and have done wonders to the team’s confidence. "Now that we do not have Suarez, we have become used to another kind of play, in which suddenly the team appears more," Pereira told El Pais after the win against Colombia. Suarez is undeniably Uruguay’s difference maker, and they’ll probably need him to make a deep run at Copa America Centenario. But playing nine games without their best player has made La Celeste look like a more cohesive unit and, if nothing else, better prepared for life without Suarez. Now it’s time for Uruguay to prove it on the big stage.